« Today in History. 100 Day’s left in the year. 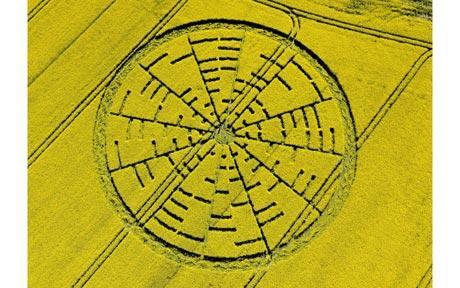 Crop circle conundrum – Mysterious Wiltshire. Crop circles were revealed as a hoax almost 20 years ago, so why do so many people still flock to Wiltshire, convinced of their extraterrestrial powers? The Barge indeed is Crop Circle Central – there’s even Croppie ale for sale – and circle aficionados arrive to camp here from all over the world: in the visitors’ book Kerry from Australia has written: ‘Great crop circles! Great people!’, while Miranda and Trond from Norway say: ‘Great to be back at Croppie HQ!’ No wonder an official at the Wiltshire Tourist Board tells me that they love crop circles; together with the numinous delights of Stonehenge and Avebury Rings they’re the county’s biggest draws. Last year was a bumper year for fantastically elaborate, large crop formations – 70 or so, many within spitting distance of the Barge and one taking three nights to fully emerge – and in early August this year, more than 45 had been reported. And, remarkably, in June the scientific journal, Nature, ran a piece on them. They’ve certainly lured a shaven-headed David Cheeseman down from Lewisham and he’s sitting in the pub’s back room, looking at photos of recent formations. Mike and Sue are camping, too, and Sue is adamant. ‘They’re all man-made. And,’ she says with a grin, ‘there’s fewer this year because of the recession; cutbacks have to be made everywhere.’ That seems a bit unfair: 45 is a decent number, but it’s true to say they’re wider spread this year – possibly, one all-too-human circle-maker tells me, because the farmers near Honeystreet were miffed by last year’s abundance. For, yes, humans have laid claim to making almost every circle known about. But their beauty, complexity and mysteriousness are such that not everyone is persuaded that a group of soi-disant artists, moving through the fields at night with planks, tape measures and garden rollers, could create such glorious formations. Particularly when the first circle-makers to tell their tale to the media were two pint-loving sixtysomething watercolourists from Hampshire called Dave Chorley and Doug Bower. More spiritually, they’re documented by the Wiltshire Crop Circle Study Group, whose coordinator is a charming, softly spoken French-Canadian called Francine Blake. Their office, in Devizes, is stuffy and full of papers, so we speak in the car park; Francine – wavy, white hair, dark pink top, linen trousers – is excited because a new circle has been reported near Warminster: ‘The first since 1998!’ She has been studying the circles since 1989 and moved to Wiltshire in 1991, after a particularly beautiful, highly symbolic formation appeared at Barbury Castle. In those pre-internet days, Francine only learnt of Barbury after it had been harvested – not for nothing are circles known as ‘temporary temples’ – and that prompted her move to Wiltshire. Now she and her ‘six or so’ staff send planes up to photograph the circles, publish a magazine called The Spiral and produce ravishing calendars of the best formations. She and her colleagues have also sent off soil samples from fields where formations have appeared to Defra’s predecessor and to laboratories abroad. As for mathematics, earlier this year a formation appeared at Wilton Windmill, which seemed like Euler’s Identity, one of the most beautiful equations known to man. Alas, one mathematician pointed out that the formulation was so executed that its translation from binary code was altered from an ‘i’ to a ‘hi’, which could, the mathematician said, ‘be somebody’s idea of a joke’. Worse, the ‘h’ could be a nod to Planck’s Constant – and planks are used by human circle-makers to create their formation. But at least she’ll be interviewed, unlike Michael Glickman, a long-term luminary of the circle scene, whose mathematical interpretations of the phenomena are far too abstruse for me. Instead, he lets rip with a majestic telephonic tirade. ‘The media are stupid, narrow-minded, bigoted and boringly predictable. I want nothing more than sensible treatment of the most important event on planet Earth. Lord Haddington, who’s taken a keen and sympathetic interest in circles since the late Eighties, tells me he thinks all this year’s are made by man; Francine disagrees and is certain that it’s physically impossible for such work to be done in a short summer’s night. So off she directs me to a recent circle near a Saxon flint church at Chisbury. It’s a five-pointed star, surrounded by five chevrons, 10 diamond shapes and 41 mini-circles – I’ll later read, on Crop Circle Connector, that ‘it seems to call our attention to a close conjunction between Planet Venus and the bright star Regulus in Leo’. It’s gorgeous, though better in the photo, but I don’t feel anything. And my tape recorder works. Which doesn’t surprise Rob Irving, the main author of The Field Guide: The Art, History and Philosophy of Crop Circle Making. It was to Irving that a Wiltshire policeman uttered the immortal line: ‘I don’t want to get involved in a philosophical discussion with you, sir, but they can’t all be hoaxes.’ Irving would take issue with the word ‘hoax’ because it presupposes that there are ‘genuine’ circles, though he does think it possible that weird winds may have brought about some circles. Irving’s a big fellow, with a bit of beard below his lip, greying hair and a black T-shirt. He’s 53 and first got involved in the Croppie scene in ‘1990, 1991’. He started to make circles, he says, ‘because people said it couldn’t be done’. He’d gone to a talk about circles and the speaker, a ‘field officer’ for the Centre for Crop Circle Studies, had said: ‘While we don’t know what’s creating circles, we know what isn’t – and it’s not humans.’ He laughs. Now he’s a poacher turned gamekeeper, occasionally doing commercial circles for the likes of Mitsubishi, but essentially an artist and doctoral researcher into art and the landscape, which is, partly, what he sees crop circles as being about. As to their originators, Irving says, tongue only half in cheek, Doug Bower is ‘the greatest artist of the 20th century – or the most provocative’. Doug Bower? Well, it was he and Dave Chorley who swirled the first crop circle, back in 1976, after a few drinks at the Percy Hobbs, at Cheesefoot Head, near Winchester. They’d been talking about UFOs and the books by Arthur Shuttlewood, a journalist on the Warminster Times, about UFOs over Warminster and what his paper called the ‘Warminster Thing’. Might it not be fun, they thought, to swirl some UFO landing pads of their own? Cerelogogy, as crop circle study became known, was born. One researcher attributed the phenomenon to ‘plasma vortices’ – essentially wind effects that produced the swirling; and as Doug and Dave expanded their repertoire to incorporate straight lines and pictograms, so did the plasma vorticist expand his thesis. Others embraced more esoteric explanations, such as psychokinetic downloading from the collective unconscious, UFOs and higher intelligences. And the number of circles grew and grew, many of them 30 miles from Doug and Dave’s patch, and highly complicated. Doug and Dave were clearly not alone. Still, it was Doug and Dave who went public in 1991: Doug told television cameras that there was nothing like being in a field of English corn at two in the morning, after a few pints and some cheese rolls, stomping corn. Interestingly, the ITN report on their self-disclosure said: ‘This doesn’t mean all the circles are fake. After all, one counterfeit coin doesn’t make all coins counterfeit.’ And, among some devoted cerelogists, it became accepted wisdom that 80 per cent were man-made and 20 per cent ‘genuine’. But a display of circle-making by a team of young engineers who won the 1992 International Crop Circle Making Competition was a revelation to the maverick biologist, Rupert Sheldrake: ‘For flattening the crop, they used a roller consisting of a piece of PVC piping with a rope through it, pushing it with their feet. To get into the crop without leaving footprints, they used two lightweight aluminium stepladders with a plank between them, acting as a bridge. For marking out a ring, they used a telescopic device projecting from the top of an aluminium stepladder. A string was attached to the end of it in such a way that by holding the string and walking in a circle around this central position a perfect ring could be marked out without leaving any trace on the ground in the middle.’ That’s complicated kit. The designs are marvellous: perhaps it’s no wonder that, as Pilkington says, some cerelogists believe human ‘circle makers are channels for a greater force and that some formations are made by divine intervention’. Certainly, when Pilkington has told people what he’s done, he’s got into near fights: people want to believe. Such antipathy has gone to extremes: according to one of their number, one group of circle-makers had ‘potatoes stuck up their exhausts, wing mirrors ripped off our cars and threats of violence’. We move back towards my car. A couple appears and the woman asks if we’ve been at the circle. They’re Inga and Erik, and they’re Dutch, over here to look at circles. They were at Chisbury yesterday, and it was perfect: they’re very keen to see the Cley Hill formation. And what, I ask, do they think brought the circles into being? Inga smiles, knowingly. ‘You mean, are they man-made, or not?’ She smiles again. ‘That’s mystic: that’s a mystery.’ And off they go, ready for a sense of wonder. There are still some crop circles to view in the Wilthire area and Histouries UK will continue to offer private ‘crop circle’ tours. Seeing is believing – the main crop circle saeson kinks off on May 2011 and contimues through to September 2011. 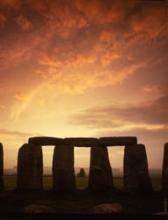 Why not join a guided tour of Stonehenge and Avebury and experience a ‘real’ crop circle for yourself.